Facebook’s algorithm for determining what is displayed within the news feed is tweaked and altered constantly to deliver a better experience for the average Facebook user. For many brands on Facebook, this causes consistent headaches as they try to stay ahead of the curve. One of the most difficult challenges is when a certain strategy works very well for a long period of time, only to be changed down the road. Some of these strategies have been with the intent to “game” the algorithm, while other strategies were simply playing into human psychology. Over the past 6 months, Facebook has been cracking down on older successful strategies ━ we’ll walk through a few of the recent changes to provide a better understanding of what changed and what you can do about it. Facebook has been discussing their disdain for memes for many months. But, in the past 6 months, they’ve taken stronger steps to reduce their exposure in the news feed. Facebook issued warning after warning, that they do not want to see meme content being generated by pages. The warnings started about a year ago, but we’ve seen that an increasing number of pages begin to get severely penalized by over using them. In our research, we’ve found that they tend to penalize the entire page for using meme content (as opposed to penalizing each individual post). Takeaway: The best approach towards the “meme content” penalty is not to stress on whether or not your content will be scanned by Facebook because it has a caption on it. Instead you should ask yourself whether your posts upset your audience. Call-To-Actions are a staple in many forms of marketing. The line gets blurry when Facebook deems certain call-to-actions as “like-baiting. For the average marketer, it’s difficult to make a strong distinction between the two. According to Facebook: “”Like-baiting” is when a post explicitly asks News Feed readers to like, comment or share the post in order to get additional distribution beside what the post would normally receive”. 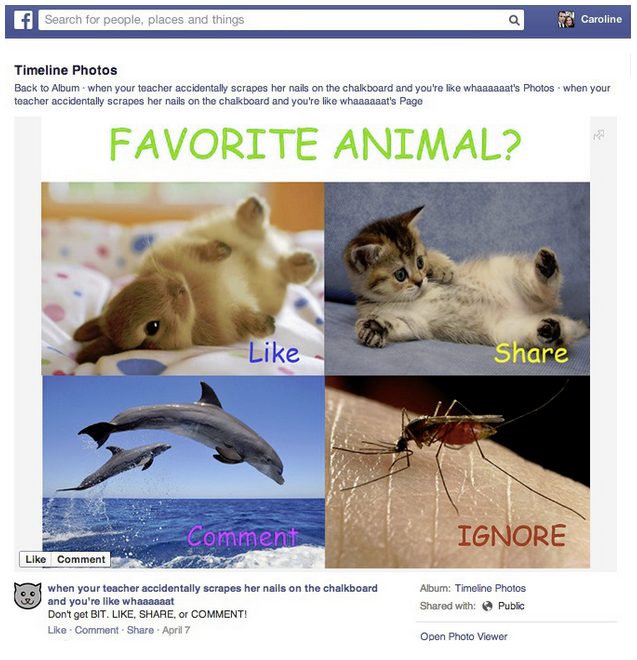 In their examples, it’s normal for a photo or object to have a call-to-action for specifically Likes, Comments, & Shares. 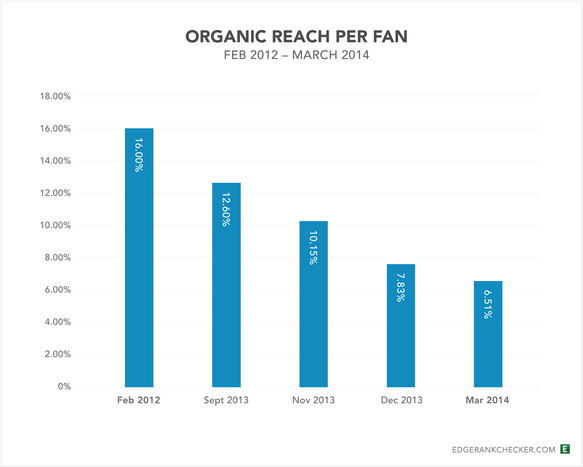 Facebook is looking for stronger organic engagement, without having to beg the user for engagement. So, the key with like-baiting is to avoid blatant calls to action that are simply looking for engagement. Takeaway: Be reasonable and try to encourage conversations naturally. In an ideal Facebook world, every page should be creating their own unique content every day. While many pages do share unique content, the majority do not. Facebook wants to reward these pages who do this, by reducing the exposure for pages who are not. The challenge here is how fairly Facebook can assess this. Just because a page like CNN might be the biggest, doesn’t mean it broke a story — how will Facebook make a choice between a page like CNN and a local news outlet? Has image/video existed in Open Graph before? Takeaway: Try not to worry about how Facebook will track/enforce something like this, and focus on creating your own unique content. At least, content that has a unique view point. Facebook wants to cut down super spammy sites, and the best way to do that is by cutting off pages that share them frequently. Takeaway: Consider the quality of links that you may share on your Facebook page. Don’t sacrifice quality in the face of “getting something out there”. The Reach for many brands plummeted around early December. One of the last saving graces was the Status Update. 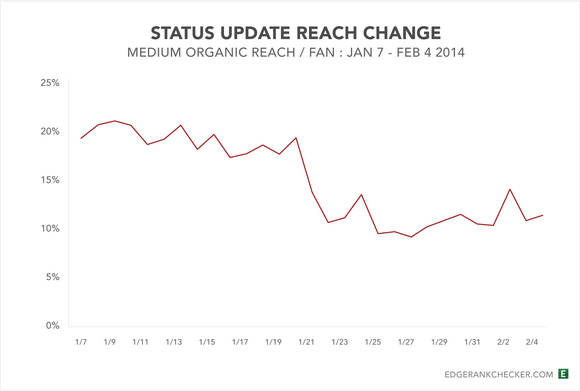 Some brands had lost ½ of their Reach, but could still maintain high levels of Reach by using Status Updates. Facebook quickly came in and reduced the Reach of Status Updates as well. Takeaway: Don’t worry about what type of content Facebook prefers. Study and analyze your own audience to see what they want to see in their feed. Facebook made an announcement that they want to increase the value of high quality links. The initial reaction was quite positive from page admins, as they felt like their content might get an increase in exposure. After, the change went into effect, many page admins found their link content was still struggling. The result of raising the bar on high quality links was that less pages gained exposure for high quality links, but the ones who benefited from the additional exposure — drastically gained exposure. Almost 6 months later, brands are adjusting to what their audiences want to engage, but the brands who truly understand this are reaping the benefits. Takeaway: Links need to be high quality. Pages that create and publish average content will get below average results. Facebook has and will always continue to tweak/adapt the news feed algorithm. Many page admins wonder what Facebook really wants. I suggest you download Facebook’s Paper iOS app to see what their team of human editors chooses, this is an excellent proxy for the direction Facebook is headed. The most important part to remember is that the news feed is a highly competitive space. Only the best content that is truly engaging with the Facebook audience will reap the substantial benefits. Understand that engagement is at Facebook’s core. At the end of the day, Facebook’s user base is built on people engaging with the platform. It is up to the page admin to continue to adapt and understand what is optimizing that engagement for their own page.